Whether in small groups or larger “caravans,” migrants often travel together, for support and solidarity, but also for safety along a route rife with crime and other dangers. In the last eight months, the U.S. has increasingly restricted access to asylum at the border by claiming that there is inadequate capacity to process those who legally seek protection by presenting at a port of entry. Now the U.S. is requiring some to stay in Mexico for months or years as their claims are processed. These changes raise urgent concerns about their safety and well-being. Many have ventured from their Central American homelands, desperate to escape the violence there, yet knowing that, despite their perseverance and caution, they will face widespread discrimination, hostility, and crime en route, with little protection or recourse. In December, two Honduran teens were murdered in Tijuana. The unaccompanied minors, thought to be 16 and 17 years old, were strangled, stabbed, and left in an alley near the youth shelter they’d been staying at. The crime—a stark tragedy in its own right—is not an isolated incident, but a troubling reminder of the countless violations and violent crimes suffered by migrants in Mexico, both in transit and at borders. As violence in Central America spurs more people to migrate through Mexico, criminal elements, corrupt officials, and high impunity, in tandem with hardline immigration enforcement, have resulted in persistent and unaddressed insecurity and life-threatening risks for migrants on the road. 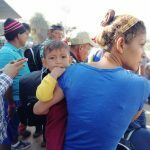 Given their extreme vulnerability and inadequate government response to their plight, migrants are compelled to pass through Mexico without assurances of safety or, if victimized by violence or human rights violations, justice. Now that the U.S. is requiring some asylum seekers to remain in Mexico while their cases are pending, crimes against migrants in the country’s northern states are likely to rise. CRIMES AGAINST MIGRANTS: Mexico is experiencing the highest rates of violence in two decades of government record-keeping, and, relative to other countries in the Western Hemisphere, the greatest increase in homicide rate. From January to November 2017, there were 23,101 murders, the most ever in a single year, with the largest numbers in the border states of Baja California and Chihuahua. These days, Tijuana’s murder rate is comparable to that of El Salvador. These shocking statistics apply to the population at large, both citizens and migrants, but migrants moving through Mexico and staying at the border—who increasingly include families, children, and pregnant women—are most vulnerable. Their worn clothing and shoes, full backpacks, and different racial makeup mark them as easy prey for organized crime, smaller local gangs (called bandas), smugglers, and corrupt officials, including Federal Police, Municipal Police, and immigration officers. When an agent of the government abuses, tortures, or extorts money, it is a human rights violation as well as a crime. Extortion, one of the most common crimes, is on the rise, often accompanied by assault, kidnapping, or threats to kill victims or turn them over to migration (if the perpetrator isn’t already an immigration agent). In one study, 9% of migrants surveyed in 2009 suffered extortion, but by 2012, that rate rose to 21%, and is likely higher today. Kidnapping victims are targeted individually or in small groups, taken by force or deceit (for example, “befriending” a migrant and offering to house them), and beaten or tortured until they relinquish the phone number of a relative in the U.S. or Central America. Whether or not the ransom is paid, the victim may be forced into unpaid labor, trafficked, or killed. In 2011, Mexico’s National Human Rights Commission Victims (CNDH) reported over 20,000 migrant kidnappings. To add to the horror, unfound or unreturned victims of kidnapping and trafficking may be among those who are disappeared (impossible to record in total) or summarily executed (not always resolved, even upon discovering a mass grave). INADEQUATE PROTECTION AND IMPUNITY: The Mexican government doesn’t want for mandates to protect migrant crime victims. In 2007, it introduced humanitarian visas for migrants who suffer crimes. In 2011, a new Migration Law established certain rights for migrants in transit, among them, the decriminalization of illegal entry and presence in the country, access to services, and procedures for reporting crimes and abuses. Two years later, the Victims Law was passed to promote restorative justice for citizen and migrant crime victims. Nevertheless, many of these policies exist more on paper than in practice. Mexico’s National Institute of Migration (INM) allocates 82% of its budget to enforcement, and only 11% to protection of migrants. The Mexican Commission for Refugee Aid (COMAR), with only four offices across the country, employs a meager fifteen officers to ensure protection for the average 100,000 migrants detained each year. CNDH is one of the best-resourced human rights agencies in Latin America, with a $73 million budget; yet though authorized to issue recommendations upon investigating “serious crime,” it has issued only a handful despite hundreds of complaints received each year. And the Southern Border Program, instituted in 2014, has only widened the scope of violence and victimization. By escalating the number of enforcement operations and concentrating them along train routes and checkpoints, this approach has scattered migrants—and those who prey upon them—to outlying areas, away from well-traveled routes and shelters where they could find safety and resources to report crimes. Migrants are more likely to make their way on foot, attempting to stay “in the shadows,” yet exposed to a greater likelihood of becoming targets of crime or corruption. Beyond poorly implemented, funded, and staffed protective services, impunity is rampant. Of 5,824 crimes against migrants reported in Chiapas, Oaxaca, Tabasco, Coahuila, and at the federal level (2014–2016), only 49 resulted in convictions and sentences. Fully 99% of crimes against migrants go unpunished! Though impunity is a major problem for all crimes in Mexico regardless of who the victims are, this is an alarmingly high rate. Such unfettered impunity perpetuates ongoing violence and aggression, and cartels and gangs continue to finance their operations in part through victimizing migrants. In recent years, Mexico has established Specialized Prosecutor’s Offices at the state level, but the impact on impunity has been near negligible. In Oaxaca, of 383 complaints filed over four years, only four resulted in sentences. This is largely due to inefficient and ineffective investigations, poor coordination among agencies, and inconsistent documentation of data. The Federal Attorney General’s Office needs to be more proactive in prioritizing the thorough and timely investigation of crimes against migrants and encouraging reporting, such as visiting shelters and checking in with human rights organizations. “MIGRANT PROTECTION PROTOCOLS”: Less than a week after the two youths were murdered in Tijuana, the U.S. instituted a new set of rules for handling asylum claims. Called the “Migrant Protection Protocols,” they are not remotely protective; in fact, they will endanger lives, requiring asylum seekers to remain in Mexico as their claims are processed, where they are subject to crime and other grave dangers. They will also face homelessness, hunger, and challenges in finding employment. Though the policy stipulates that children and people who fear persecution in Mexico will be exempt, migrants who are returned are not asked about their fear of being in Mexico, and only if they volunteer that information are they sent through a process with stringent criteria to prove that they will face persecution if made to wait at the border. Mexico has agreed to cooperate reluctantly, but there is not adequate capacity to house and provide services for the large number of migrants at its northern border. Non-profit shelters are already overwhelmed, and the time for cases to be completed may take years. The current immigration court backlog is 800,000, and initial asylum hearings are now being scheduled for as late as 2023. Another major concern is legal representation, since it is crucial to mounting successful claims. In 2018, the US immigration courts decided 42,242 asylum cases and over 15% of applicants didn’t have legal representation. Of those who who didn’t have attorneys, only 9.6% were granted asylum. (Transactional Records Access Clearinghouse, Syracuse University). With asylum seekers in one country and their immigration attorneys in another, legal access will be much more severely limited or unavailable, raising obstacles to building strong cases and creating many due process issues. Moreover, the policy is likely illegal because it violates the Congressional directive that asylum seekers be allowed to stay in the U.S. while their cases are pending (as they’ve been permitted to do until now, either in detention or on parole) and international conventions (which prohibit the return of asylum seekers “in any manner whatsoever” where they face threats or persecution. CONCLUSION: The epidemic of crimes against migrants in Mexico is an urgent crisis, compounded by extremely high impunity, and the U.S. cannot return asylum seekers to wait there while their cases move through an over-burdened system. The KBI urges you to contact your Congressional representatives to oppose the “Migrant Protection Protocols” and U.S. investment in Mexican immigration enforcement. Instead, let them know that you support U.S. funding to Mexico and technical assistance for: (1) migrant services and security; (2) investigations and prosecutions of crimes against migrants; and (3) measures that strengthen oversight and accountability for police and INM agents. Your action is a form of accompaniment, and a way to use your voice to help put an end to the harmful, often deadly, consequences of inhumane policies and political inertia.